Central Asian rivers and the Caspian and Aral Seas teem with fish species shared by Kazakhstan and its neighbors. The beluga sturgeon is a massive fish that can be found in freshwater lakes in Kazakhstan. Kazakhstan is a landlocked country in Central Asia and Eastern Europe.The inland lakes and rivers in the country provide habitats for about 150 species, making fishing a widespread activity and source of employment. The northern snakehead is a freshwater fish species native to most parts of Asia and parts of Europe. The fish is found in stagnating or slow-flowing water that have heavy mud and vegetation. The snakehead is capable of occupying land for two days before returning to the water. The snakehead feeds mainly on crustaceans and amphibians. It has eyes in the middle part of the upper jaw with a large mouth that goes beyond the eye. The primary concern about the fish is its potential to become invasive, which could in turn destroy natural ecological balance. The lake minnow is a species native to Kazakhstan with its principal habitats in small lakes, shallow bays, swamps and human-made lakes with slow-moving to stagnant water. The fish hibernates during cold winter seasons. The diet of the lake minnow is primarily benthic animals and planktons that exist within its habitat. The freshwater fish has been identified as the least concern species due to the vast distribution of their range. 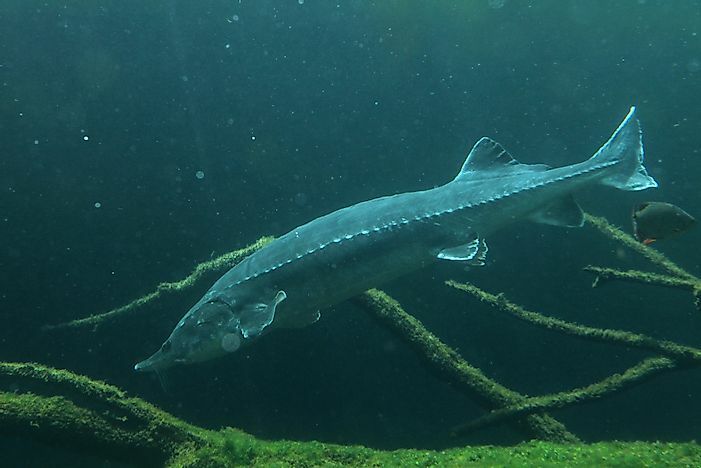 The beluga sturgeon is a critically endangered anadromous fish native to the Caspian Sea. The fish’s population is endangered due to overhunting and poaching. The fish is a worldwide delicacy, with the female roe making it a target for poachers. The fish is large, growing up to 16 feet and it is generally accepted to be the largest freshwater fish in the world. Some of the members of these species are known to live for more than 100 years. The beluga sturgeon is an active predator feeding on other fish, waterfowl and seal pups. The fish can survive in both fresh and salty waters. Due to its rapidly decreasing numbers, most governments have banned their trade as well as regulated their fishing. The stone leach is a benthic freshwater species native to Kazakhstan found mainly in slow-moving quiet waters with temperatures between 18 and 22ºC. The stone leach also prefers waters with dense aquatic weeds, and can grow as long as five inches. Kazakhstan is renowned for its extensive fish activities along the rivers and lakes of the country. Most of the fish caught is mainly consumed for food while others engage in fishing as a sport or for trade. Extensive fishing has led to the decline in the numbers of some fish species making them endangered or vulnerable. The government of has made efforts towards the conservation of fish through regulation of fishing and establishing protected areas.